이 귀부(龜趺) 2기는 영암사터 내의 법당터를 중심으로, 동쪽과 서쪽에 각각 남아 있다. 영암사의 정확한 창건시기는 알려져 있지 않으나, 통일신라 전성기 때의 많은 유물들이 남아 있어 그 즈음에 세워진 것으로 여겨지고 있다. 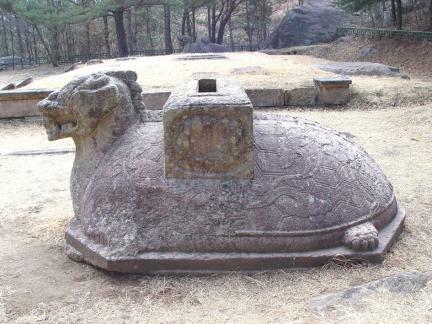 절터 안에는 법당터를 비롯한 여러 건물의 기단(基壇)이 남아 있어 당시의 거대했던 규모를 짐작하게 한다. 귀부는 거북의 모습을 하고 있는 비의 받침돌로, 원래는 그 위로 비몸돌과 비머릿돌이 얹혀 있었을 것이나, 양쪽 모두 지금은 귀부만 남아 있는 상태이다. 동쪽 귀부는 거북의 등무늬가 6각형이고, 비몸돌을 괴는 네모난 비좌(碑座) 주위에는 아름다운 구름무늬가 있다. 전체적인 모습은 거북이지만 머리는 용머리처럼 새겼고, 목은 똑바로 뻗어있으며 입에는 여의주를 물고 있다. 서쪽 귀부도 6각형의 등무늬를 배열하였고, 등 중앙에 마련된 비좌는 4면에 안상(眼象)을, 가장자리에는 연꽃잎을 새겼다. 서귀부는 동귀부보다 얇고 약간 작지만 거의 같은 솜씨로 만들어진 것으로 보이며, 특히 동쪽의 귀부에서는 정교하면서도 강한 생동감이 느껴지고 있다. 이 귀부 2기는 각 부 양식이나 주위의 석조유물 등과 관련지어 볼 때 9세기 통일신라시대의 작품으로 짐작된다. 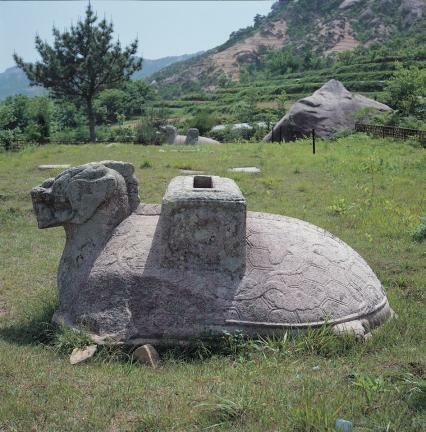 Two tortoise-shaped pedestals on the Yeongamsa Temple site are located in the east and the west of the Buddhist sanctum site. 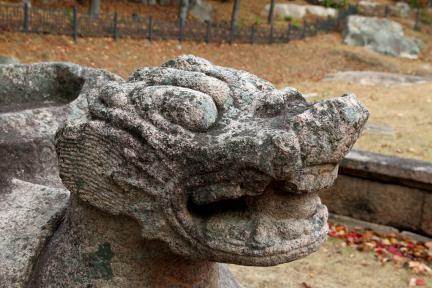 The foundation year of Yeongamsa Temple is not known, but with many relics of the heyday of the Unified Silla era, it is estimated to have been built around that period. As there are many foundations of constructions on the site, including the sanctum, it is assumed that the temple was huge in scale. 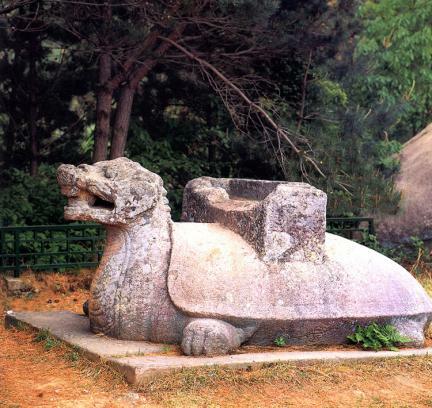 These two tortoise-shaped pedestals of steles remain without their main bodies and capstones. 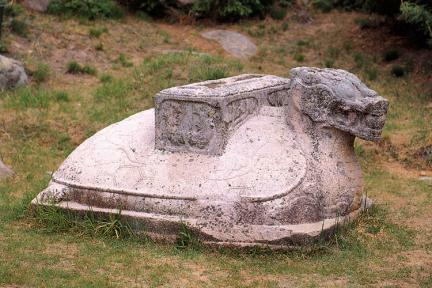 The eastern one has its back engraved with hexagonal patterns, while the rectangular supporting stone for the main body is carved with a cloud design. 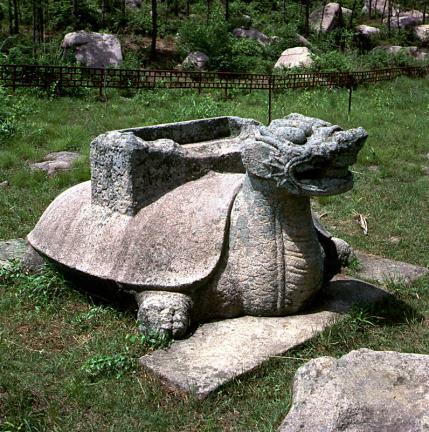 Although it looks overall like a tortoise, it has the head of a dragon with a stretched out neck, holding a magic bead in its mouth. 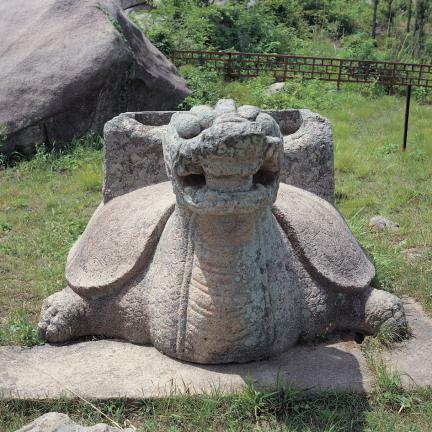 The western pedestal is also engraved with hexagonal patterns on its back. 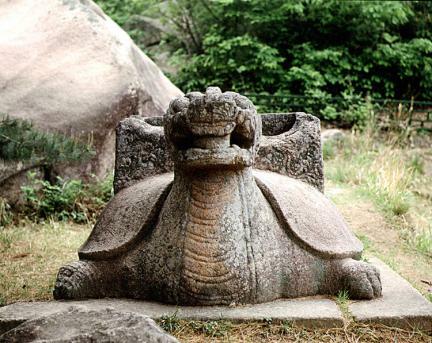 The supporting stone for the main body is engraved with panel decorations on its four sides and lotus petals on its edges. 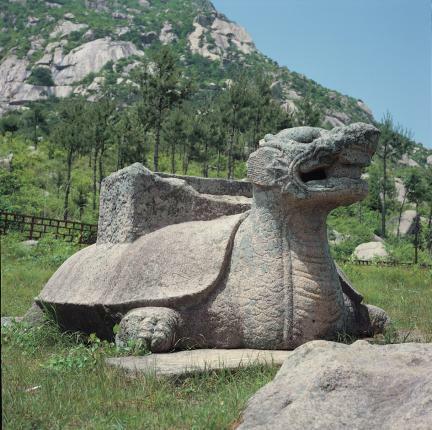 It is slightly thinner and smaller than the eastern pedestal, but both show almost the same workmanship, and in particular, the eastern pedestal exhibits a sophisticated and vivid expression in its sculpture. 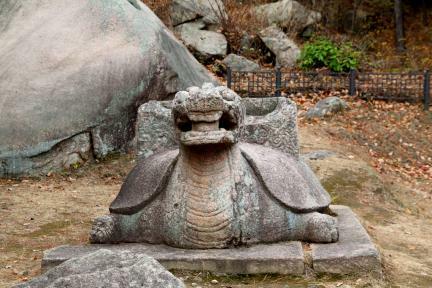 Judging by the styles of these two pedestals and the stone relics found around them, it is assumed that they were built during the ninth century of the Unified Silla period.